It’s been three years since Chris Clark unleashed his Empty The Bones Of You box of delights and promptly reaffirmed his position as one of Warp’s most promising talents. This sophomore effort wasn’t so much revisiting his early musical escapades, as heard on Clarence Park, as totally reinventing his sound, turning it upside down to strip it out of its puppy fat and refocus. Having since lost his first name so people wouldn’t ‘wasted oxygen on “Chris”’, Clark returns with Body Riddle and once again goes right back to the roots and settles new scores. On first listen, Body Riddle shares more than a few similarities with its predecessor: fat synthetic sounds, rolling rhythmic patterns, heavy bass lines and acute melodic sense. Yet, as his limited Throttle Furniture EP, released earlier this year, pre-empted, everything here is more detailed, more fine-tuned, as if the man had spent the last three years locked up in a studio manually building every single bar of this record. This is fine craft. Here, Clark layers his sounds with incredible precision, at times blending strings, electronics and beats into one big conglomerate of textures, at others assembling infinitely small sonic details into magnificently light and airy compositions. Shimmering melodies appear from nowhere and infectious grooves rise from the most unlikely soundscape without disturbing a single moment the dense fabric of this record. Right from the start, Clark hits hard and scores high. Her Barr is remarkably ambitious and complex. Built on countless tectonic layers, the mood persistently changes from dream-like sequences to dark and gritty industrial noises, incorporating the main melodic line in a variety of forms and tones. This constant shift sends shockwaves throughout Body Riddle, infecting even the more minute details and resulting in sound constellations unexpectedly erupting in convulsions, beats patterns morphing into complex organic formations and random noises melting into lush melodic plains. On Herzog, a whirlwind of electronics debris crashes down on an uplifting melodies to rise again and again, while a clunky beat and distorted keyboards drive Ted to the border of futuristic disco heaven. Elsewhere, Springtime Epigram and Dew On The Mouth offer more tempered timbres, surprisingly evoking Boards Of Canada in part. Night Knuckles is wonderfully frenetic and spasmodic while The Autumnal Crush charts vast spaces and draws the night in to reveal delicate iridescent noise formations. All this infinite detailing could have well been the death of this record, but Clark is way too smart not to continuously inject playful touches throughout and retain the sheer entertainment value of his music. 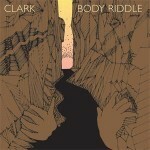 Sharp, incisive, accessible and thrillingly enjoyable, Body Riddle reveals Clark at his most confident and masterful yet.